Duck's breast is a delicious alternative to chicken. The meat is rich, and the skin has a flavorful layer of fat that renders and crisps beautifully in a well-cooked breast. There are a few methods that work well to cook a delicious meal. 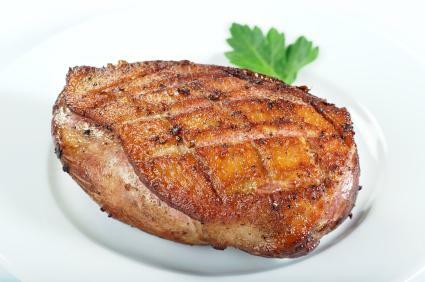 While the primary method of cooking a whole duck is slow roasting, you have more options when cooking a duck's breast. The ideal method involves rendering the fat from the skin so it is nicely crispy while retaining the juiciness of the meat underneath. Score the skin using a diagonal crosshatch pattern. Season both sides of the duck's breast well with sea salt and fresh cracked black pepper. Allow the breast to sit, salted with skin side up, for about 15 minutes at room temperature. Pat breasts dry with a paper towel to remove the excess moisture. Heat one to two tablespoons of grape seed oil over medium high heat in an oven proof sauté pan until it is shimmering hot. Place the breast skin side down in the pan. Leave the breast in contact with the pan without moving it until it is well browned and fat is rendered, about six minutes. Turn the breast over in the pan and place the pan in your preheated oven. Roast for eight to 10 minutes, until the internal temperature of the breast is about 130 degrees for medium rare. Remove the breast from the oven and rest, tented with foil, for five to ten minutes to allow the juices to reabsorb into the meat. Slice the breast on the diagonal and serve alone or with a pan sauce. Place the breast between two pieces of plastic wrap and pound to an even thickness of about 1/2 inch. Score the skin using a crosshatch diamond pattern. Season the duck's breast on both sides liberally with salt and pepper. Heat one to two tablespoons of grape seed oil over medium high heat until the oil shimmers. Place breast, skin side down, in the pan. Allow the breast to remain in contact with the pan for about six minutes - until the skin is well browned. Turn the breast over and reduce the heat to medium. Allow to continue to cook for another seven to eight minutes, until the internal temperature reaches 130 degrees. Remove duck from pan and tent with foil, allowing it to rest about ten minutes. While duck rests, proceed to making a pan sauce, if using one. Slice duck on the bias and serve with pan sauce. Serve the duck as indicated above, drizzled with a little high quality balsamic vinegar, or try the following recipe for a delicious main dish. Score the skin of the duck's breasts in a crosshatch pattern. Season the duck on both sides with sea salt and fresh cracked black pepper to taste. Heat clarified butter in an ovenproof sauté pan over medium high heat until the butter shimmers. Place the duck in the pan, skin side down, and allow to sauté until fat renders and skin is brown, about 6 minutes. Flip duck over and move pan to oven. Roast for about eight to ten minutes, until the internal temperature is 130 degrees. Using a potholder, remove the pan from the oven. Place duck's breasts on a platter tented with foil. Leave two tablespoons of drippings in the pan and place on the stove over medium-high heat. Add chicken stock, port, and shallots, scraping browned bits from the bottom of the pan. Add cherries and simmer until liquid reduces by half, about three minutes. Whisk in butter a few pieces at a time until well incorporated. Stir in fresh chopped tarragon. Slice duck breast on the diagonal and serve topped with sauce. If you've never tried duck, you will love its earthy flavors. It pairs well with other earthy flavors, such as mushrooms or Pinot Noir wine. Likewise, duck tastes great with something slightly sweet or spicy like the pan sauce listed above. Best of all, duck breast cooks up so quickly it makes a fast weeknight meal.